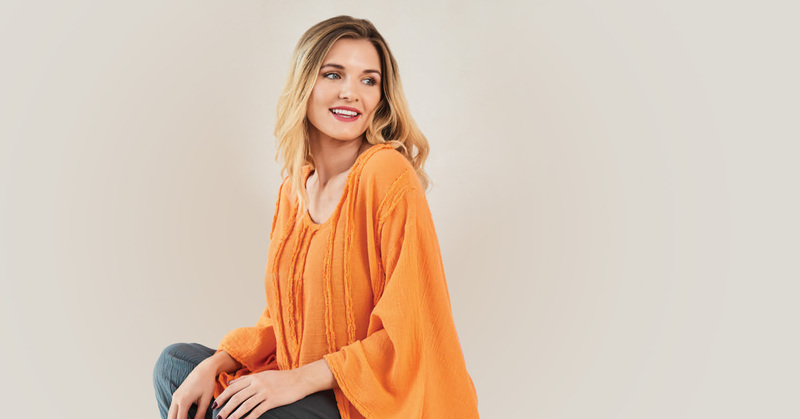 Fall into Fashion - And comfortable Cotton Gauze Clothing | Oh My Gauze! For most men, Fall means football. For many women, Fall means…fashion. Big. Bigger. Biggest. Sleeves aren’t the only thing that will be generously proportioned this fall fashion season. Shapes in general will leave you plenty of room to breathe this fall. Boxy jackets. Longer and fuller skirts. Wider and roomier pant legs. Oversized menswear blazers were even spotted at Alexander Wang and Off-White fashion shows debuting fall 2017 women’s styles. Fall fashion is truly loosening up this year. And then some. Oh My Gauze! certainly approves of this trend. Our 100-percent cotton gauze clothing is roomy, breezy, and breathable. It’s also fully functional and almost maintenance-free – it’s completely washable, never in need of ironing, and will not shrink. Fuller skirts? Wider and roomier pant legs? We’ve got it all here in our collection of cozy cotton “lagenlook” (German for “layered look”) clothing. So come check us out. And fall into a fashion that fits you best. According to many of the top tastemakers, other fall fashion trends in 2017 will include wide-waist belts, and bright plaid patterns that were so popular with women in much of the 1990s. Once again, Oh My Gauze! is onboard with all these trends. We offer comfortable, stylish, and fun accessories. Many of our completely cotton clothing pieces come in bright colors – as well as both white and black. Some of our amazing and alluring pieces are even available at online sale prices right now. So go ahead. Go wild. Go crazy. Express your individuality. Celebrate your fall freedom. Create a seasonal wardrobe that works best for you. And let Oh My Gauze! help you find your own unique, fun, functional autumn style. We’re so confident you’ll love the way you look and feel in our clothing, we offer a fantastic return policy. If something doesn’t seem right to you, let us know. We gladly accept returns of unwashed and unworn merchandise with original tags – within 30 days of purchase. We can even exchange your item for a different color, size, or entirely different style.